Grand Theft Auto Online’s newest event week has rolled in, and trafficking is the name of the game. Between the double rewards and discounts, the spotlight is shone directly on content from Gunrunning and other items and missions focusing on delivering contraband items to and fro, while making a nice dime off it all. This week brings no new vehicle or mode to GTA Online, however that means players can catch up on all the heaps of vehicles they probably don’t own by making twice the usual income on Gunrunning sell missions. These missions will pay out double RP and GTA$ through the 16th of April. Saving money is almost as good as making money, so the 50% boost on all bunker research sparing you the expense of fast-tracking the projects also helps keep cash in the bank – which you can then blow on all the discounted goods right off the bat. Unsurprisingly, the double rewards promo for last week’s Target Assault Race mode has been extended for another week. Players have had time to find partners with whom they work well together, and a week has surely been enough time to get acquainted with all the maps and get a hang of how score the most points, so this week should be even more lucrative than the last. If you haven’t had a chance to try it yet, Target Assault sees teams of two engage in races with weaponized vehicles – the driver tries to hit the checkpoints first, while the gunner tries to hit as many targets as possible. A huge selection of discounted items have hit the in-game stores to make up for a lack of a new vehicle this week. 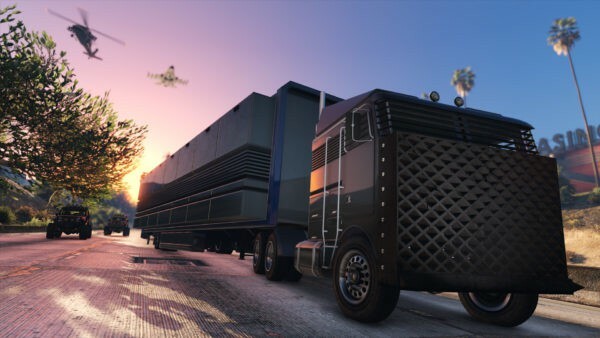 Mobile Operations Center cabs and bays are both 30%, while the magic 25% discount returns for a slew of vehicles – included are the Pfister Neon, Overflod Autarch, HVY APC, Vom-Feuer anti-aircraft trailer, BF Dune FAV, Declasse Weaponized Tampa and the HVY Nightshark. All MK II weapon upgrades are also 25% off. Since Gunrunning sell missions are what you should be focusing on this week to fill your coffers, bunkers and associated items are also discounted in case you want in on the profit but don’t yet own the mission-specific property. The Farmhouse Bunker is half-price, the Thomson Scrapyard Bunker is 45% off, the Smoke Tree Road Bunker is 40% off and all renovations and upgrades are 30% off. Rockstar has also teased next week’s content, which is a new move. Three new vehicles will be coming, which are the vintage Weeny Issi Classic, the Vapid Flash GT sports car and the Sea Sparrow Chopper. The Weeny Issi will also be featured in a new mode called The Vespucci Job where the mentioned vehicle will be driven by one player while another driving and LSPD squad car will be in pursuit. It ain’t police DLC, but hey, it’s something!